Bathroom and Kitchen updates are our specialty. 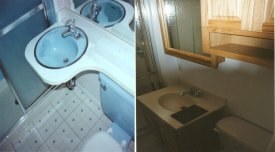 We recently remodeled the master bathroom of Mr. Bob Mchale of Pike Creek, Delaware. 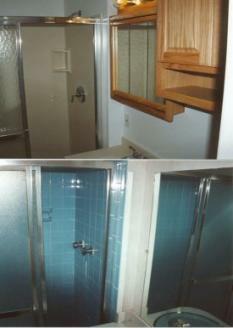 He previously had a 1960's era blue tile bathroom, which held up for close to 30 years. For this project we used the state of the art solid surface material called Swanstone. Swanstone is a solid surface material used in many applications around your home for such things as tub surrounds, shower stalls, backsplashes and countertops. Notice how the shower walls and vanity top coordinate with each other. This material carries a limited lifetime guarantee against scratches, stains or wear. Other products that are in the solid surface category that you may be familiar with are Corian from DuPont and Surell from Formica. near the cost of those other products. Sometimes even half as much! 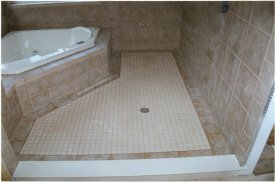 If your interested in getting you bathroom remodeled or would like to talk to Mr. Mchale about our craftsmanship personally click the references page for his number or just contact us for a free estimate today!